Has the flu made an appearance in your household this season? Flu is not a reportable disease in most areas of the U.S., so only estimates of numbers of cases and related medical visits are possible. Preliminary reports from the Centers for Disease Control and Prevention (CDC) note that between October 1, 2018, and January 26, 2019, there were between 10.1 and 11.7 million cases of flu in the U.S., at least 4.7 million flu-related medical visits, and up to 141,000 hospitalizations. Although CDC has been making these “in-season” flu estimates since 2010, reporting them to the public in real time is new as of this season. The estimates are made using mathematical models based on rates of laboratory confirmed flu-related hospitalizations. In addition to flu statistics, CDC offers information on the geographic spread of flu throughout the country. Based on state and territorial estimates, flu is currently widespread in most states, as the CDC graph below demonstrates. 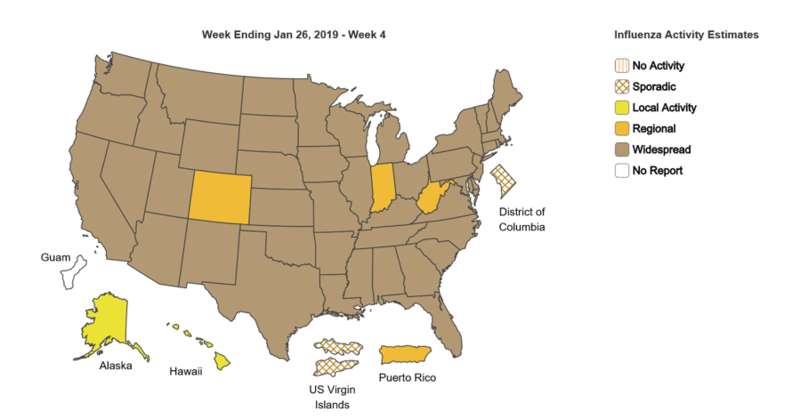 But in which states did flu activity begin and at what rate did it become widespread in the 2018-2019 season? You can find out by accessing the interactive version of this map on the CDC website. Simply click the green “play” button at the top left of the map image on that website to view the path of flu through the country beginning in October. As you are viewing the map, remember that the graphic does not indicate flu severity, only its spread. 1. Get your flu shot: Late is better than never, but “Vaccine by Halloween” is a good rule of thumb. Everyone six months old or older should be vaccinated unless otherwise advised by their doctor. 2. Wash your hands frequently and thoroughly: Flu viruses can be picked up easily on the hands after they make contact with frequently touched surfaces, such as hand rails and door knobs. Wash flu viruses down the drain with frequent hand washing, and try to keep your hands away from your face. Touching your hands to mucous membranes, such as the mouth or eyes, can deliver flu virus particles to your body. 3. Disinfect frequently touched surfaces: Flu viruses can live on surfaces for up to 24 hours. Clean surfaces first with detergent and water, followed by applying a solution of 1/4 cup of regular bleach (approximately 6% strength) in 1 gallon of water. Let air dry. Alternatively, wipe surfaces down with pre-moistened wipes containing chlorine bleach. 4. 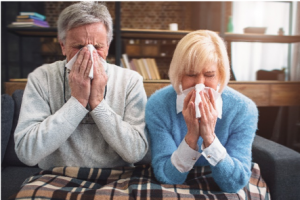 Think of others: Stay home when you are sick (and practice #2 and #3 above to help prevent spreading the flu virus to family members) and encourage others to do the same. Cover coughs and sneezes with a disposable tissue or cough and sneeze “into your elbow” (not your hands) to help prevent spreading mucous droplets into the air that others breathe. Practice healthy habits, including getting adequate nutrition, sleep, and exercise, to shore up your defenses against flu. We congratulate CDC on providing real-time estimates of U.S. flu statistics. As informative as these estimates are, however, we recommend they not be used by the public as a gauge for preparing for this potentially deadly infection. To borrow the words of baseball legend, Yogi Berra, flu season “ain’t over till it’s over,” and what may look like a mild flu season can suddenly intensify. Are you taking significant precautions to avoid the flu?